How to get there: Starting from Salzburg, go south on A10/E55 towards Bischofshofen. Shortly before Bischofshofen, exit to Pfarrwerfen. You will be travelling in the direction of Bischofshofen along Hwy. 159, turn left across the river and the trainline in order to enter the small village of Pfarrwerfen. Immediately after you enter town, follow the road (Werfenweg) that curves left around Hotel Burgblick. Immediately after this hotel, a smaller road exits left. Turn into this road (leave the Werfenweg) and measure from here. After 0.4 kilometer, keep right and at 1.0 km, continue straight ahead. At 1.8 kilometer, keep right and finally, at 6.1 kilometer, turn left into a fairly new parking area located in the forest. This road climbs the hillside in many hairpin curves. There are various other side roads, but the correct road is the one that look bigger and heads uphill. Park here, this is the trailhead, location N47:28.641, E013:12.969, elevation about 1130 meter. 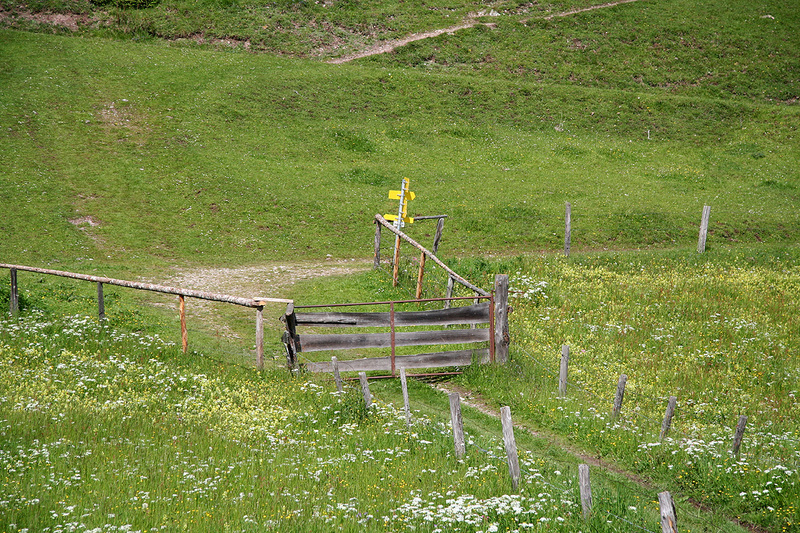 To the Werfener hut: The trail heads directly uphill from the parking. 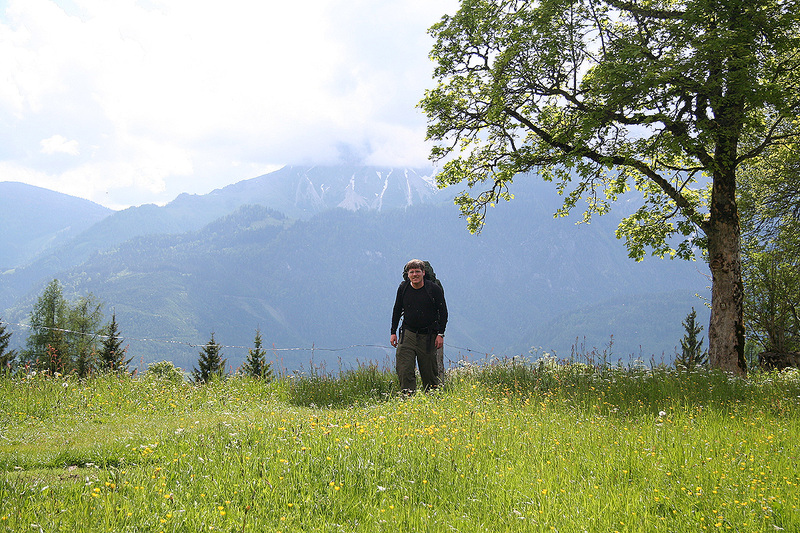 As you hike up among the trees, you will soon emerge on a small plateau with some pastures and a few houses. 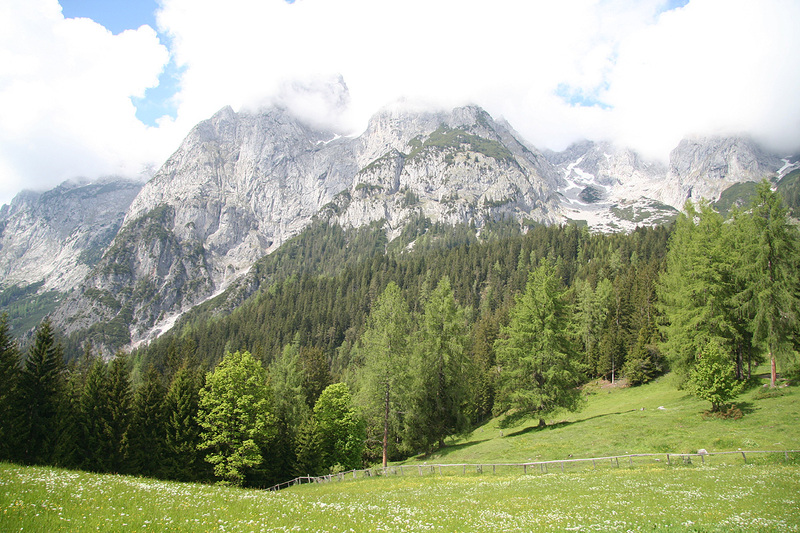 This is Alpengasthof Mahdegg, about 10-15 minutes uphill. 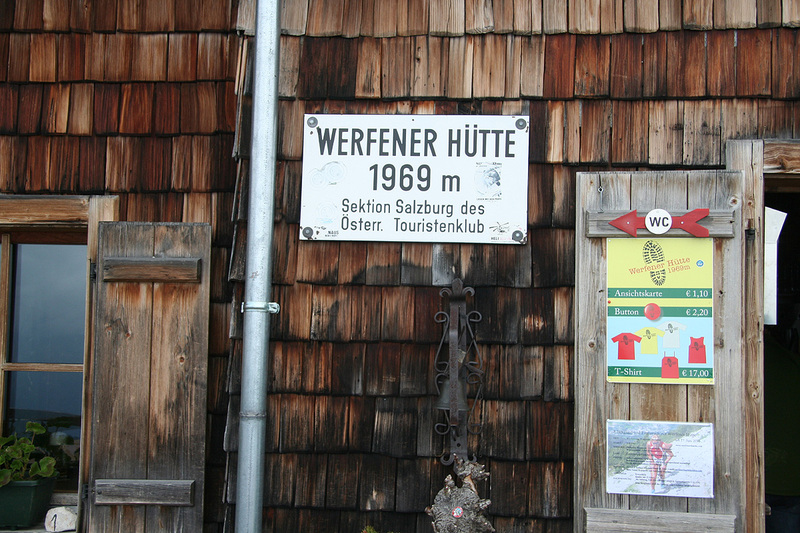 There are two different trails, the normal trail is marked 32 (sometimes 32b), follow the small forest road further uphill and go right in a few forks, there may be some signs as well saying Werfener Hütte. 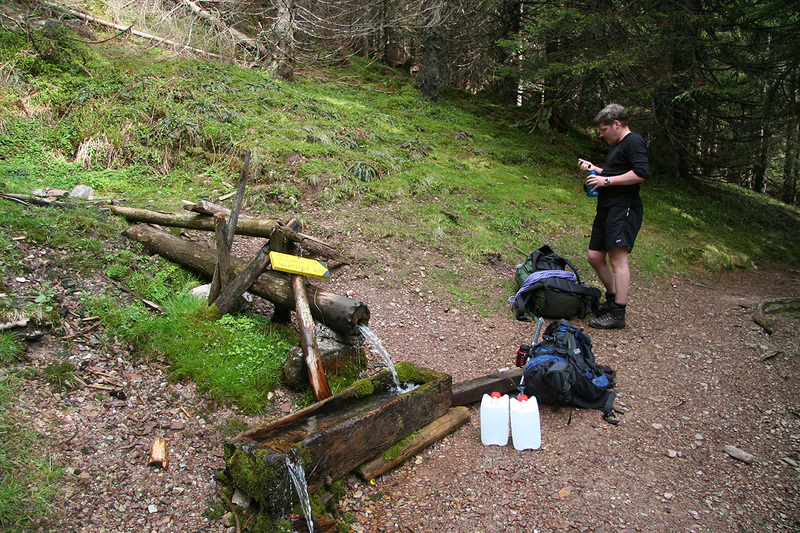 After about one hour, you will arrive at a very nice water supply, the water running through and out of a tree trunk. There may be plastic cans here and a sign asking you to carry some water to the hut. Each can is 5 liter, so this will add 5 kg to your pack. Soon thereafter, the trail emerges from the forest and into more open terrain. Looking uphill, you will see the hut at the top of a long and steep hill, just below the towering cliffs that makes up the skyline. 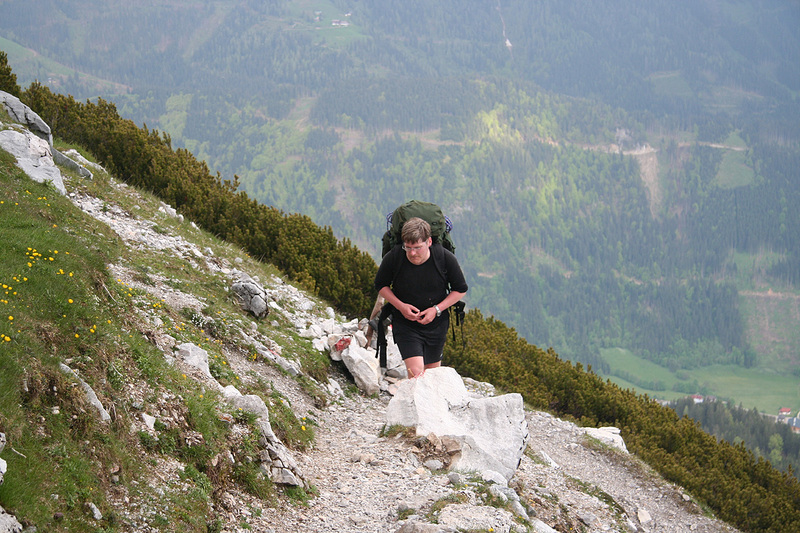 The trail makes many zig-zags up this last stretch, the last curve (very close to the hut) having a sign saying DANK GOTT, Die Letze Kurve. To the summit: Exit the hut and turn right. Just beyond the hut there is a trailfork, stay left at the trail that descends slightly as it traverses the steep mountain slope. Your trail should have signs for the Edelweiss hut. 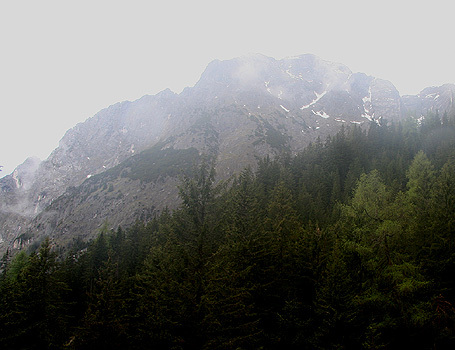 (The smaller trail that heads right is a climbers trail to Werfener Hochthron, 2362 meter.) As your trail approaches the obvious cut (steep valley) that cuts between the mountains, there is a signed trail fork. The bigger trail descends back down to Mahdegg, while the correct trail climbs slightly as it continues a traverse to the lower end of a steep ladder bolted to the rock above you. This trail is rather faint and shows more limited use. Climb up to the lower end of this ladder (protected by a cable), then climb the ladder (about 20 meter high!) 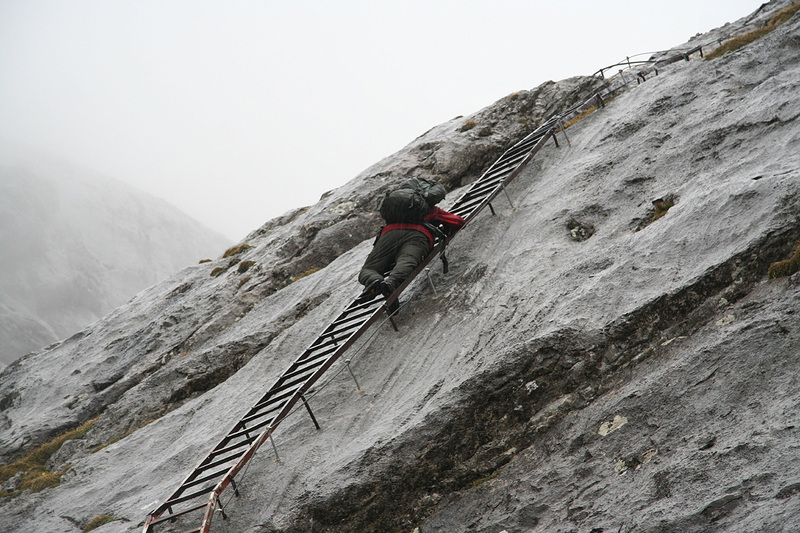 to the top of this steep cliff. 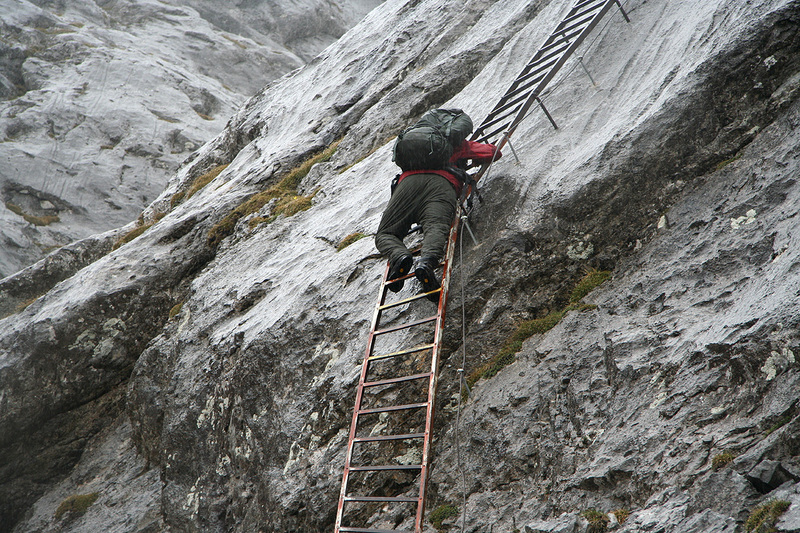 As you exit the ladder, the trail continues steeply upwards improved by steel hooks attached to the rock. The slope then eases and your route continues uphill towards the saddle, then more left where more elevation can be gained. 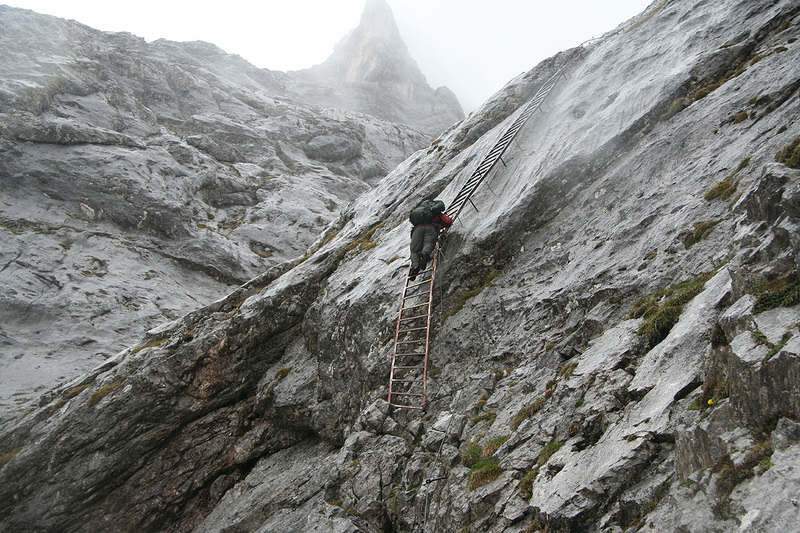 You will reach another signed trail fork, however the correct route continues in the direction of the Edelweiss hut. Higher up, and slightly across the main ridge, a new trail fork, this time the Edelweiss direction continues down slope, while the route to Raucheck turns left. The trail now traverses behind another mountain, then passing a smaller hump (there is a bit up and down) before finally climbing up on the rear side of Raucheck. 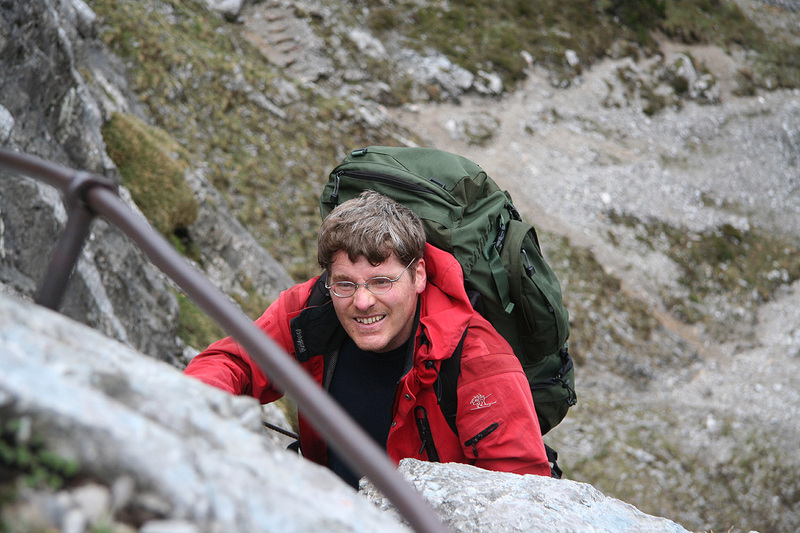 As the trail levels out, hike left and descend into a shallow saddle before climbing gently the last uphill slope to the summit cross. Comments: I came by air to Munich and Åke came to the airport by train from Brussel. We got a nice, but weak Mercedes rental car and drove to the trailhead without any incidents. Leaving at 1545, it took us 2 hours to reach the Werfener hut, including some rests and the carry of 10 liter of water to the hut. We were well received being the only guests for the night. A good evening meal, then bed. Getting up shortly before 6, we had breakfast and were on the trail by 0645. The ladder looked kind of spooky, we had to move across some snow that buried the fixed protection before getting onto the ladder. I was waiting at the top and Åke offered a smile as he knew the top was near. We continued uphill and ran into more and more snow. 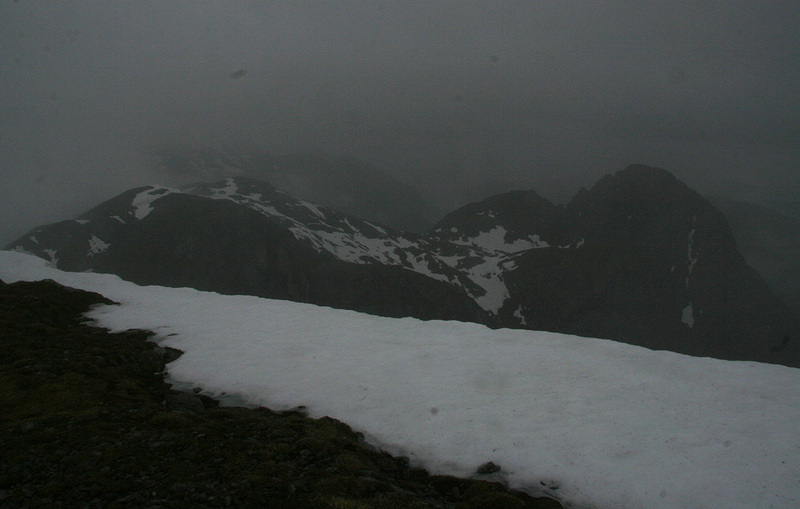 Mostly ok, but a few places with soft snow that made us sink rather deeply. 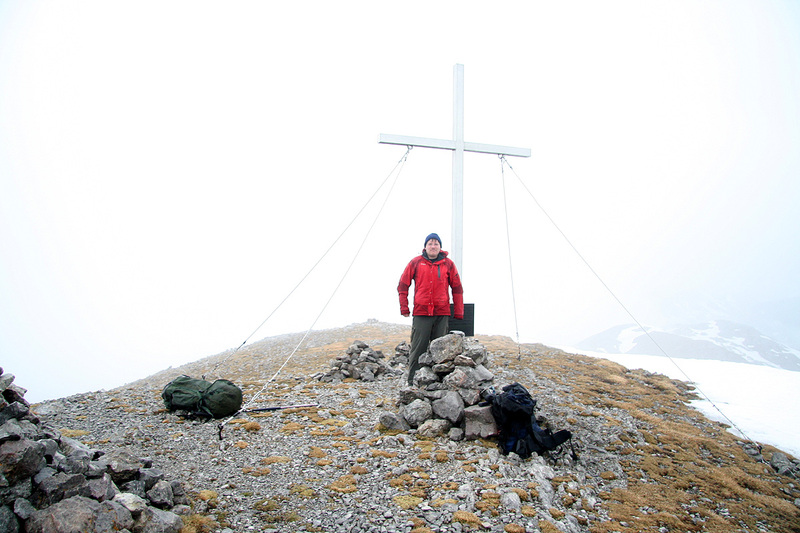 Overall, the going was fairly easy and before long we arrived at the final hill and the summit cross. The climb had taken 2:15, fairly acceptable given the snow. We signed in the nice summit register and noted that nobody had signed since last November, that is half a year ago. A few pages in the register took us back to 2007, this summit is not visited by big crowds. The weather was not nice and we left after 15 minutes. 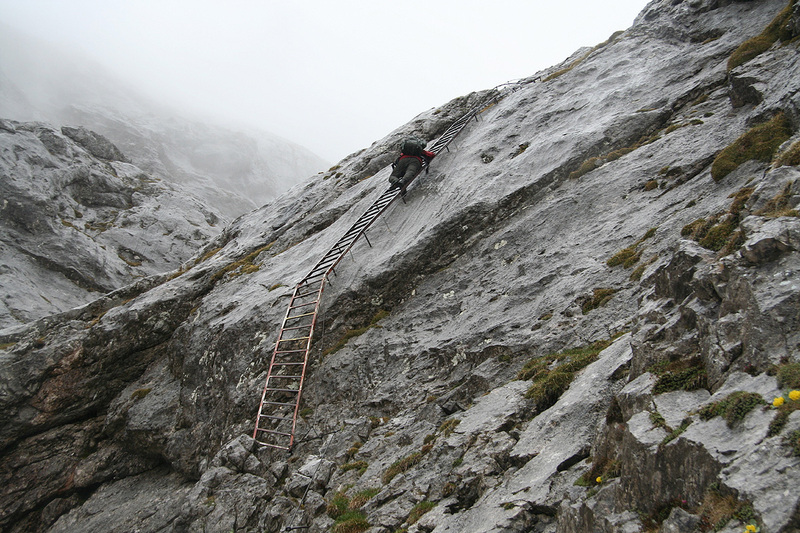 The only "crux" on this climb is the area near the big ladder, and we were soon back to this point. 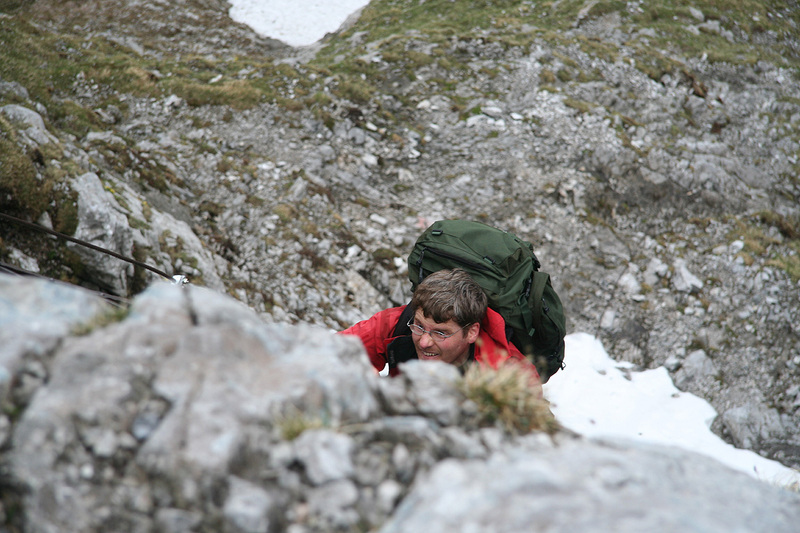 I climbed down first and got my camera out to document Åke descending. We were back at the hut by 1115, a well deserved lunch before walking back down to the car. The final descent took 1:10, we were quite happy with the day and looked forward to our next peak Birnhorn. Raucheck, as seen from the trail below the Werfener Hütte. Summit view, the weather is closing in.